December 1st, 2014 is World AIDS Day. The theme this year is “Focus, Partner, Achieve: An AIDS-free Generation.” Visit here for more info on World AIDS day. World AIDS Day is held on 1 December each year and is an opportunity for people worldwide to unite in the fight against HIV, show their support for people living with HIV and to commemorate people who have died. World AIDS Day was the first ever global health day and the first one was held in 1988. For a lot more info, events, and lifestream of the Whitehouse Event, visit AIDS.gov. 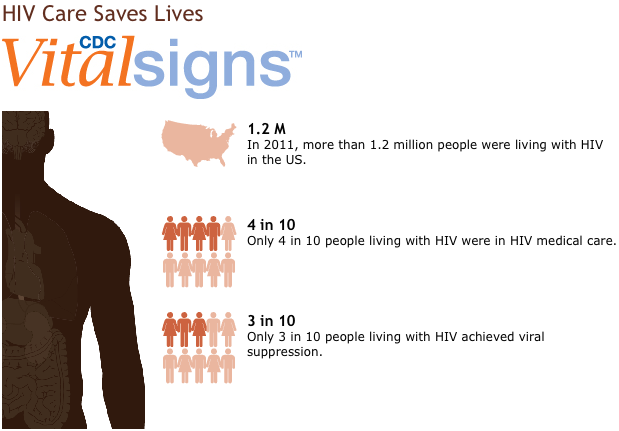 Also check out CDC.gov for much more info on AIDS care and treatment, including the CDC initiative Vital Signs. I can’t even with these tweets. A most basic understanding of virology completely accounts for why these different viruses cause distinct diseases, and have different incubation times and disease progression. UGH! This saturday is National Gay Men’s HIV/AIDS Awareness Day! Yesterday CauseScience posted the CDC report finding that half of HIV positive gay men are not receiving adequate treatment. The CDC has recently launched an awareness campaign for all people living with HIV, HIV Treatment Works. The HIV Treatment Works campaign encourages people living with HIV to Get in Care, Stay in Care and Live Well. Today, you can live a longer, healthier life by being in medical care and on HIV treatment. People featured in these videos share how they live well with HIV and how you can, too. The treatments we have for HIV are extremely effective, and are one of the biggest biomedical research success stories in the last few decades. However, these breakthrough treatments are only effective if they are taken. While there are barriers to access treatment, this CDC campaign shows people how to get and maintain care and treatment. More than 1.1 million people in the United States are living with HIV. This campaign features people from across the United States who are living with HIV talking about how sticking with care and treatment helps them stay healthy, protect others, and live longer, healthier lives. This campaign shows how people living with HIV have overcome barriers to get in care and stay on treatment. Check out the HIV Treatment Works website for informative videos, info graphics, and posters and banners to get the word out about this campaign! Just a few days ahead of the National Gay Men’s HIV/AIDS Awareness Day, the CDC has issued a report detailing the lack of effective HIV treatment/care among gay men. The report was published in the CDC’s Morbity and Mortality Weekly Report. The major finding of the report is that about half of gay men living with HIV are not getting adequate treatment. WebMd has a great summary article of the report here. The research shows that while 77.5 percent did initially get HIV medical care within three months of their diagnosis, only about 51 percent continued getting care on an ongoing basis. Worse, the report shows that the percent of men getting treatment and achieving healthy ‘viral supression’ is even lower. This is extremely concerning, given that the treatment for HIV is very effective and is one of the great biomedical breakthroughs of this century. Also, it appears that there is an age and race bias, with younger men and Black/African American men having lower levels of care compared with older men and those of all other race/ethnicities. The authors discuss potential reasons for these issues, and conclude that contributing factors likely include lack of health insurance, stigma, and discrimination. This report highlights the need for outreach to increase awareness of testing, treatment, and the prevalence of HIV/AIDS. All of these numbers fall short of targets from the CDC’s National HIV/AIDS Strategy, which aims to have 80 percent of infected gay and bisexual men retained in ongoing medical care by 2015. 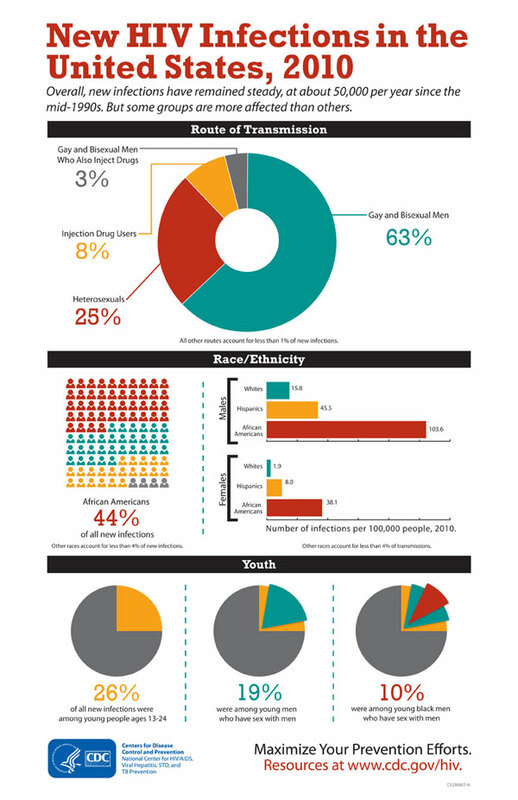 According to the CDC, gay or bisexual males make up 2 percent of the U.S. population but comprise 52 percent of Americans infected with HIV. Many are unaware they are infected. Check out the time.com article by Laurie Garrett about the HIV/AIDS researchers lost on flight MH17. As a friend and colleague of some of the researchers, her take on the impact of this tragedy is more than poignant. She also highlights that the AIDS research field, more than any other, can deal with and move beyond this type of loss. Thanks Laurie! A Tweeter asked me if the loss of Joep, Glenn, and other AIDS researchers and activists possibly on board MH17 would prove a major set-back in the fight against AIDS. No, I said. One of the glories of the AIDS community is that its bench is deep, its talents enormous, and its sorry history of processing grief and moving on is unparalleled. The dead, as has always been the case since this awful virus emerged in the late 1970s, will be mourned. And then energies will be mustered, to get the job done. Our hearts go out to all the victims of the Malaysian Airlines MH17 disaster. Even more saddening, several passengers were researchers and activists en route to the 2014 International AIDS Conference in Melbourne, Australia. Devastating and heartbreaking.